27 roses arranged in a vase or hand bouquet. Free shipping on the same day. A vase of 27 long-stemmed red roses accents with purple caspia flowers. We will add a ribbon. The color of roses can be changed by telling the staff when ordering or by email. Occasionally, substitutions may be necessary to create your bouquet due to the availability of certain flowers in various..
A bouquet of 27 red roses arrange in round shape and accent with eucalyptus leaves. Adorned with a bow tie. We will wrap the flower stems so the flowers they feed more resistant and live longer. * You can choose the color of roses and wrapping paper, please notify when ordering. 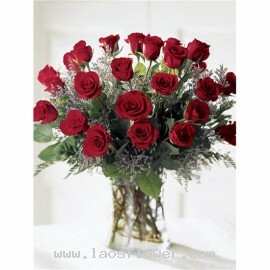 Occasionally, sub..
27 long-stemmed red roses arranged in a glass vase accents with green leaves and vines. 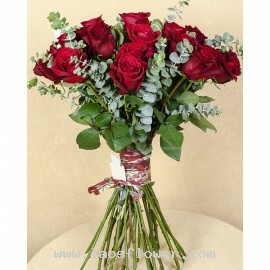 This vase of red roses is the perfect gift for 27th birthday or anniversary gift. The color of roses can be replaced. Prompted by our staff when ordering flowers. Occasionally, substitutions may be necessary t..